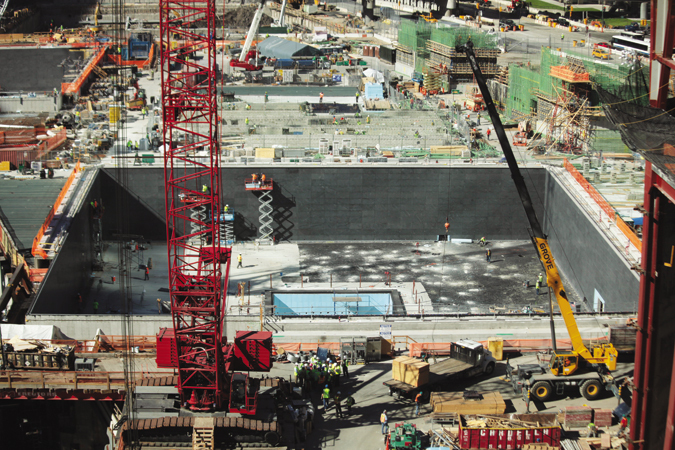 Looking into the memorial's south pool, with Tower One rising at upper right. From high atop Greenwich Street where it cuts through the World Trade Center, the drilling rig didn’t look like much. 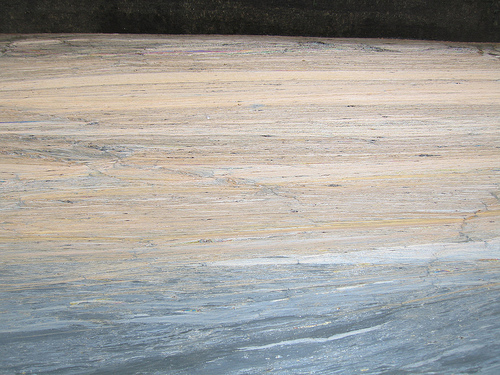 But to see the size of the men, who scrambled across it like ants on a corncob, it must have been a serious machine, capable of punching a grid of melon-sized shafts in the exposed bedrock. Even the sound, which must have been a racket, was lost in the general hubbub of the massive construction site—the clanking of steel, the shouts of men, the whining of crane hoists. Delicacy is not the first thing that comes to mind when visiting Ground Zero, where the memories of fire and horror nearly nine years old are still plainly legible by the vast scar left in Lower Manhattan’s fabric. The sight is deceiving, though. The World Trade Center today is no longer a scene of destruction, but one of bustling rebirth. Every construction site is also a ruin, its disarray disguising the fact that it is an object of progress until the finishing touches are laid, and this is a construction site par excellence. Summoning 1,500 workers every day, a number that will expand threefold over the next year, and comprising more than six major projects interlaced and pressed cheek-to-jowl, the scale is as monumental as the engineering marvels of antiquity—the pyramids of Giza, the Roman Forum, Machu Picchu. Maki's Tower 4 rises on the southeast corner of the site. 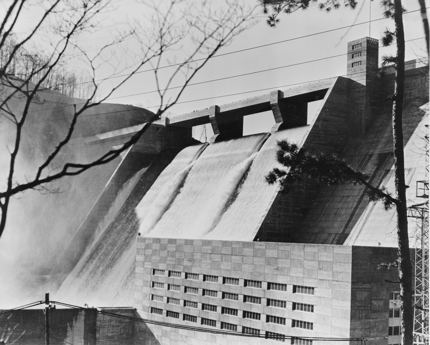 For most of its history, the site has been known more for its delays. Today, however, even a casual observer passing along Church Street can see that work is moving ahead. Steel erection on Tower 1—formerly the Freedom Tower—has now reached the 28th floor above grade, and Tower 4 is now up to the sixth. Though invisible from the street, the memorial and museum are the closest to completion, with both of the original towers’ footprints now being clad in granite; tree planting and plaza construction are slated to begin in August. But the future of the masterplan is far from secure. 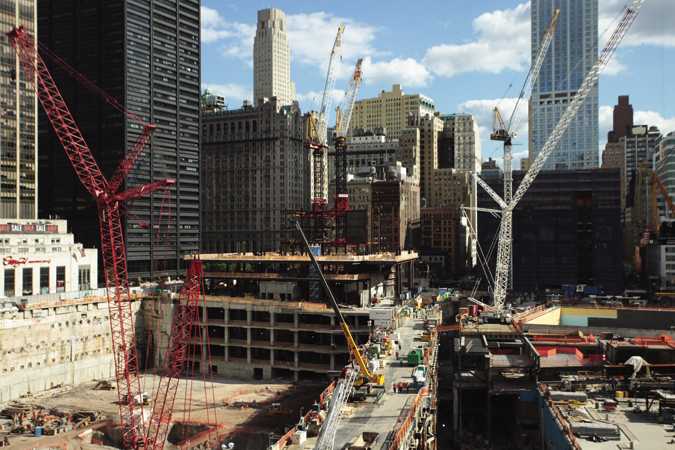 As workers race to complete the memorial for the 10-year anniversary of 9/11, the Port Authority of New York and New Jersey and Silverstein Properties remain faced with a number of uncertainties that will determine their legacy on the site. In March, the two parties signed an agreement to proceed with enough construction to ensure that all of the interconnective aspects of the masterplan will be completed in the next few years. Silverstein is only responsible for Towers 2, 3, and 4. Tower 4 is the only bright spot in this chain, due to be completed in 2013 thanks to the fact that the Port Authority and the City of New York have pre-leased approximately 60 percent of the building. Towers 2 and 3, however, remain mired in financing woes. Under the March agreement, Silverstein agreed to spend all of its Liberty Bonds and remaining insurance proceeds on completing Tower 4 by 2013, finishing off the transit hub and retail podium aspects of Tower 3, and bringing Tower 2 at least to street level. The remainder of Tower 3 will be completed if the developer can raise $300 million of private unsupported equity, pre-lease 400,000 square feet of the office tower, and obtain private financing for the remaining cost of the tower—a tall order in these times of recession and real estate pessimism. The Port Authority, along with the city and New York State, are stepping in to help, promising Silverstein a capped public backstop of $390 million and $210 million of equity. The future of Tower 2, however, is being left to market demand, so only time will tell its fate. The memorial's north pool under construction. On the Port Authority’s side of the site, the situation is a bit more stable. The Authority recently signed $100 million in contracts to bring Calatrava’s transit hall and oculus to street level and above. And Tower 1, scheduled to be complete in 2013, has received its own good news. In July, the agency signed an agreement with the Durst Organization. Under the agreement, Durst will invest $100 million in the project, assist with ongoing construction, and take on primary responsibility for tenant fit-out, leasing, and property management in return for an equity interest in the building. Currently, the Port Authority has leased about half of the 2.6 million-square-foot tower, 190,810 square feet to the Chinese company Vantone Industry and 1.1 million square feet to the U.S. General Services Administration and the New York State Office of General Services. I.M. Pei's Terminal 6 could soon be gone. Preservationists have been trying for years to obtain a landmark designation for the 1970 I. M. Pei–designed Terminal 6 at JFK Airport, but they may have run out of time. On April 29, the Port Authority of New York and New Jersey announced its intention to demolish the terminal, calling it “obsolete,” and arguing that maintaining it was not a prudent use of resources. “This came as quite a surprise to us, and a great disappointment,” said Pei Cobb Freed partner George Miller. The terminal, which originally housed National Airlines and later JetBlue, is due to be razed, along with six cargo buildings and hangars, at a cost of $42.3 million, yielding estimated savings of $1.7 million each year thereafter. Although no precise date for the demolition has been set, the Port Authority predicts it will happen next year, after which time JetBlue will use the space to build an expansion for their growing international operations. Terminal 6 sits next to another pedigreed building at JFK, the 1962 Eero Saarinen–designed Terminal 5, which the Port Authority agreed to preserve largely intact after heavy lobbying from the public and preservationists several years ago. However, without the landmark designation that Saarinen’s building enjoys, Terminal 6 will have a more difficult time obtaining a stay of execution. “The Saarinen building has historic status. The I. M. Pei building does not,” said Port Authority spokesperson Ron Marsico. 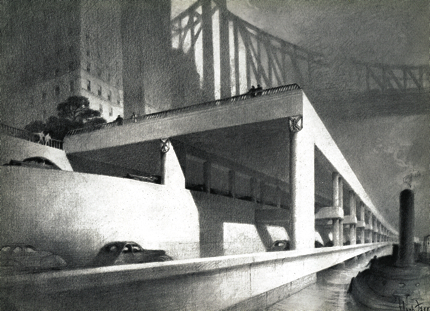 Pei Cobb Freed, along with preservationists like New York Tristate DOCOMOMO, disagree. 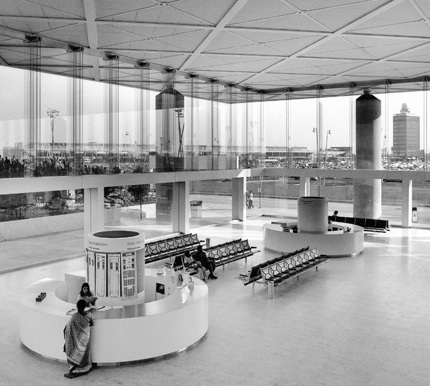 They cite the terminal’s expansive, clear-span pavilion space, a style that set a precedent for later I. M. Pei buildings such as the Louvre Museum’s pyramid and the John F. Kennedy Presidential Library and Museum in Boston. Its all-glass facade was created with an unprecedented use of glass mullions in place of the typical metal ones, above which hangs a series of glass panels, one of the first suspended glazing systems built in the United States. 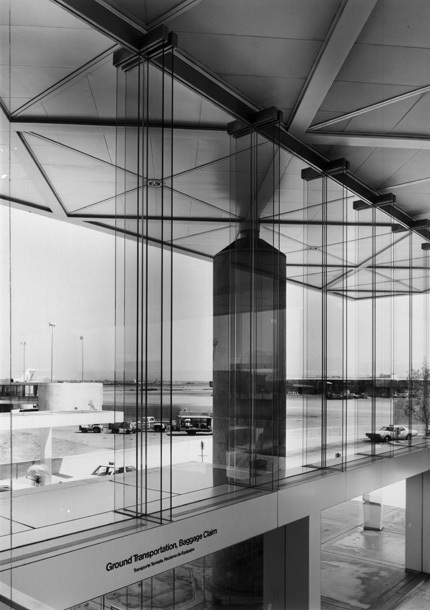 To add to the terminal’s airy feel, Pei’s team devised an innovative drainage system that feeds into the terminal’s exterior concrete columns, to avoid having to extend a vertical column of ductwork down from the ceiling. “The transparency of the glass and the uninterrupted ceiling are what give the building its character,” said Pei Cobb Freed partner Michael Flynn. The design is also notable for its approach to managing congestion, which in 1970 was just beginning to be a major pressure at airports. “We were designing just as there was this colossal expansion in the capacity of planes,” Flynn said. 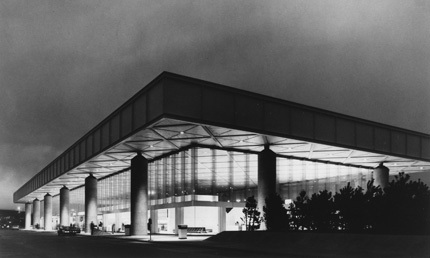 Rather than placing the arriving and departing passenger traffic in the same location at the front of the building as was the norm, Pei separated the main terminal from the airline gates with a raised walkway, creating space behind the building for arrivals and leaving the front of the building exclusively for departures. An innovative approach then, separation is now standard. DOCOMOMO is now in talks with other local organizations to band together in support of Terminal 6, and is calling for public support for preservation or reuse. “It would be a total waste of energy and money and resources to demolish a building of this scale,” said DOCOMOMO-New York chair Nina Rappaport. JetBlue did respond to calls for comment. 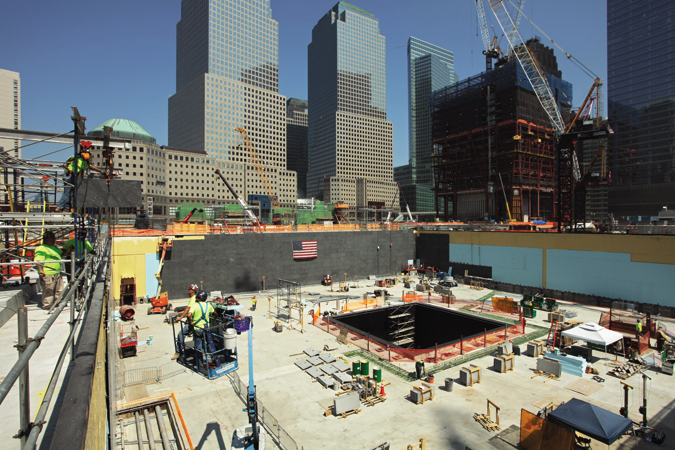 With the tenth anniversary of September 11 less than two years away, the Port Authority of New York and New Jersey is hustling to meet its latest deadlines at the World Trade Center site, which were reduced as of this summer to the completion of the memorial plaza and the temporary opening of Greenwich Street, with other pieces of the project being pushed further down the line. But that progress has been imperiled by the ongoing battle with developer Larry Silverstein over financing for Tower 2 and Tower 3. Construction delays on the two towers will hamper structural, mechanical, and programmatic systems throughout the intricately connected, 16-acre area, since those components had been planned for incorporation into the buildings designed by Norman Foster and Richard Rogers. 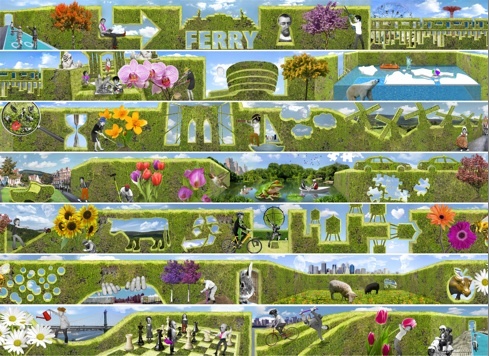 Now, to try and keep the puzzle pieces falling into place as delays drag on, the Port Authority’s board of directors authorized $20 million in design contracts on October 22. That money will go to firms already working on the site’s redevelopment, and now charged with devising contingency plans to allow the timely completion of various projects around the 16-acre site, should the two towers be put on hold. The authority is emphatic that these changes will in no way affect designs of the two projects most impacted by the infrastructure work: the PATH station and One World Trade Center. But not everyone believes the Port Authority is working in good faith. Local City Council representative Alan Gerson believes the move is simply a bargaining tactic in the arbitration that began last month. Since the private sector is suffering from the credit crunch, Silverstein wants the Port Authority to help finance both towers. But the authority has resisted such calls, offering only backstop funding for Tower 3. With negotiations dragging out for months, the parties have entered binding arbitration to reach a conclusion. “To put this on hold or to go to a Plan-B puts us in the position of a self-fulfilling prophecy,” Gerson said. Demand for office space will come back, he said, “so we have to be prepared for it.” Catherine McVay Hughes, co-chair of Community Board 1’s World Trade Center Committee, was more forgiving of the Port Authorirty, but she still wondered if the money would actually be spent, or simply had been appropriated as a show of force to Silverstein. 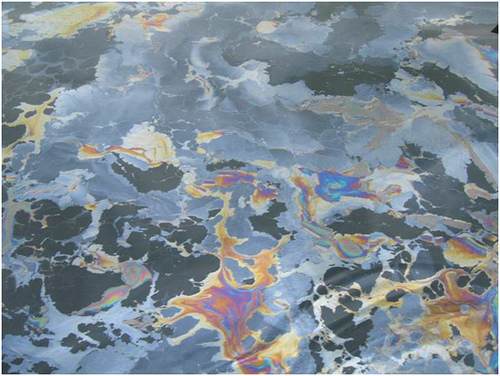 Pollution on the surface of the Gowanus Canal, part of a series taken by Riverkeeper during a June investigation. On October 9, from the banks of the Gowanus Canal, Mayor Michael Bloomberg unveiled a new, $150 million investment in the waterway's infrastructure. Except that it was not exactly new. Seven years prior, the mayor, then at the beginning of his first term, made a similar visit and a similar announcement. Only that investment never happened. 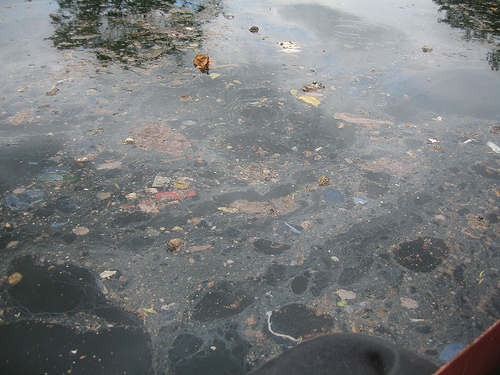 The 2002 cleanup was to bring the city in compliance with the Clean Water Act, which was being violated because during heavy rains, the sewer system would discharge raw sewage into the canal. By 2005, when the improvements still had not been made, the state filed a consent order compelling the city to come into compliance. But it was only this October that the mayor finally returned to the canal, though now for an entirely different reason, and one the new infrastructure would have little impact on: a proposal announced in April by the EPA to make the canal—one of the most polluted waterways in the city—into a Superfund site, a fate Bloomberg, with real estate interests in mind, greatly feared. "This is the beginning of a comprehensive cleanup that will be done much faster than the years of fighting through the Superfund process," he declared. That said, the promised improvements to sewage overflow have nothing to do with the toxic sediments in the canal that have caused the community so much concern, and which finally forced the EPA to take action. Furthermore the city's own proposal to clean up those sediments, which was also unveiled last month, has been questioned by environmentalists, scientists, and even the Army Corps of Engineers, the city's partner in the program. Joshua Verleun, a staff attorney for the environmental group Riverkeeper, noted that major wastewater treatment projects are always good news, "but to lump it in with Superfund is misleading—they're two different things," he said. "Both from a legal perspective and an advocacy perspective, Superfund really is the best way to clean up the canal and it's what the people in the community want and deserve." The mayor was steadfast in maintaining that his plan had more money and would be more efficient. "There is no Superfund, it's a misnomer," he said. But according to the EPA, its Superfund remediation budget is in excess of $1 billion every year. Region 2, which covers New York, New Jersey, Puerto Rico, and the U.S. Virgin Islands, receives between $80-$100 million per year, and was closer to $250 million this year thanks to stimulus funding. By comparison, the city's plan counts on the Army Corps of Engineers to tap the Water Resource Development Act for funds to clean the canal, of which there is only $50 million available each year for the entire country. The cleanup of the canal is expected to cost between $250 million and $400 million, making the mayor's nine- to ten-year estimate seem exceedingly optimistic. Another potential problem is how the city's plan seeks to bring local stakeholders to the table to pay for their portion of the cleanup. Unlike Superfund, which uses detailed investigations to identify responsible parties and compels them to pay for cleanup through legal means, the city's program would be voluntary. The city is hoping those local businesses and developers would help pay for the cleanup to avoid the supposed stigma of Superfund listing. Many of the canal's neighbors believe it is too late for that. "That's just bunk," said Craig Hammerman, district manager of local Community Board 6. "How can you stigmatize a stigmatized area? 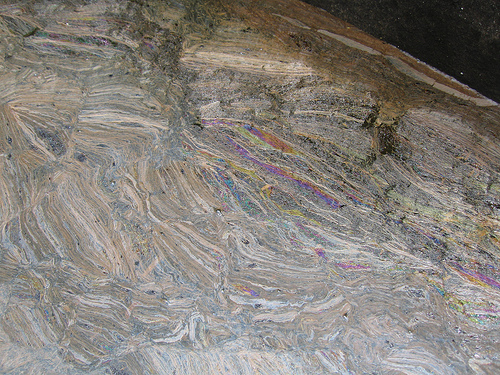 The cleanup will destigmatize it, though, and that's what we're after." The mayor has claimed that the city process also has the advantage of being faster than Superfund because it avoids litigation. But Walter Mugdan, director of Superfund Programs for EPA Region 2, counters that of the more than 1,000 Superfund sites to date, no more than one or two have involved lengthy litigation. And when litigation is called for, it takes place after the cleanup is already underway, thereby creating no delays to the process. Meanwhile, involving the Army Corps, as the city plans, could actually slow down the process by one or two years because the Corps would have to acquire permits for work that the EPA can do as of right. "I think the thing that's important with the EPA is the legal power, the legal authority, which the Corps doesn't have," said Mark Lulka, the Army Corps' project manager on Gowanus restoration. Another issue that could slow the cleanup—and add to its complexity—is that it would be a multiagency operation, between the city, state, EPA, and Army Corps. 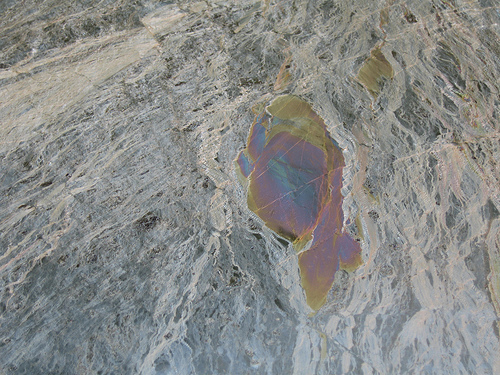 "Superfund is a known quantity," Lulka said. "Do I think we can do the work? Yes. But it's never been done before." David Von Spreckelsen, senior vice president at Toll Brothers City Living, has joined the mayor in opposition to Superfund listing. As head of the Clean Gowanus Now! Coalition, Von Spreckelsen argues it threatens millions of dollars of development, including his own 460-unit residential complex on the canal's shores, for little gain. "At the end of the day, what we'll have is a waterway where, instead of eating one fish a month, you can safely eat a couple," he said. "In a perfect world, it's a good thing, but for people on the canal, it won't make that much of a difference." But when presented with the potentially higher costs and timeline of a city-run cleanup, Von Spreckelsen began to concede that it might not be the best option. "If that were the case, of course we'd say that's fantastic," he said. "Nobody has a bigger interest in seeing this cleaned up than us because we have our rezoning and we're ready to build." Von Spreckelsen did reiterate that his attorneys had told him the Superfund process would be intractable, and he remained skeptical that banks would be willing to lend in a Superfund area. It may come down to that, though, as the Bloomberg team was dealt a blow on October 16, when Nydia Velázquez, the area's congresswoman and a tireless supporter of the canal, sided with Superfund. "With nearly three decades of experience, the EPA has the expertise and resources to carry out a comprehensive remediation of these sites, creating a safe place for New Yorkers to live and work," Velázquez said in a statement. With the city and the EPA's plans now both official, all that remains is for the EPA to announce its position on Superfund listing—whether it will take over the canal or bow to the city. That announcement was expected this fall, and while it still could possibly be announced, the EPA typically makes such announcements only twice a year, in March and September. 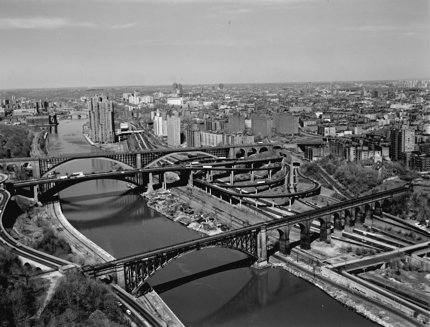 On September 29, Newtown Creek was announced as another site in the city under consideration for the Superfund list, but there was no word on the Gowanus. Whether that means it will wait until March remains to be seen, though, as Mugdan and others suggested there was nothing stopping the EPA from announcing it sooner. The mayor has made at least one official call to discuss the issue personally with Lisa Jackson, the EPA administrator who used to run New Jersey's Department of Environmental Protection. Marc LaVorgna, a mayoral spokesperson, insisted the city would prevail because its approach is superior. "They're confident they have the better plan, and we're not," he said of the EPA. "It's a difference of opinion." For Richard Plunz, director of the Urban Design Lab at Columbia's Earth Institute, where he has done work on the Gowanus, the mayor's reasoning is clear. 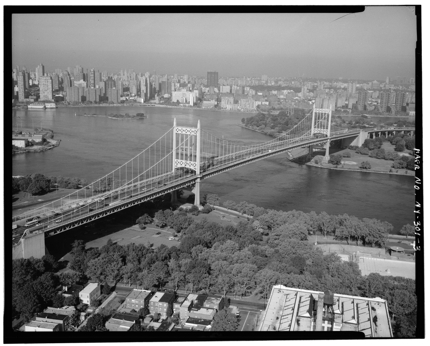 "I am not so familiar with the details of the NYC alternative plan," Plunz wrote in an email. "But of course I understand that the city doesn't want to hinder real estate investment in the short term with a more cumbersome (but effective) Superfund cleanup. This game is obvious to all." A version of this article appeared in AN 18_11.04.2009. 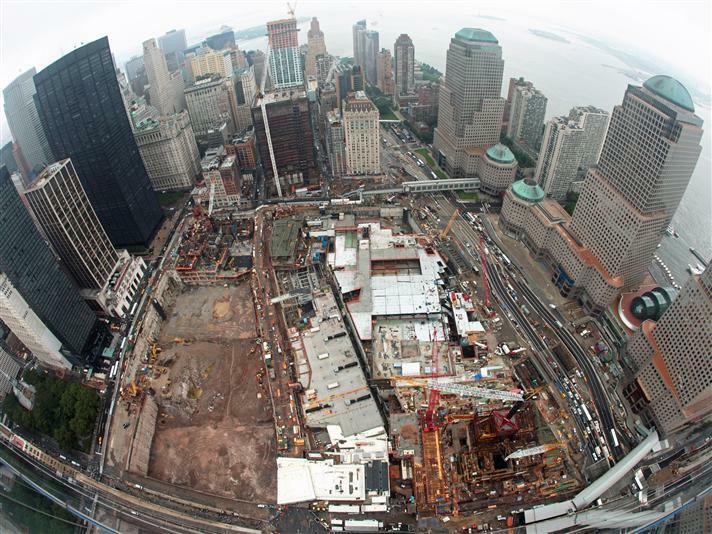 The World Trade Center site, photographed last week, is showing signs of progress. The question remains: How much progress? Is the World Trade Center site (né Ground Zero) special, or is it just another piece of Manhattan real estate? That appears to be the major point of contention between the Port Authority of New York and New Jersey and Silverstein Properties, both of whom are still in the middle of a bitter fight over who should finance the two remaining towers at the site. Both sides made their case today at a special hearing of the City Council, with Christopher Ward, the Port Authority’s executive director, arguing it is not his agency’s place to be building speculative office towers in a down economy that could impact the surrounding market, while Janno Lieber, president of World Trade Center Properties, claimed the authority was reneging on prior commitments to ensure a timely completion of a site unlike any other in the world. The hearing is part of a larger saga stretching back to the spring, when new concerns began to arise about when the site—including SOM’s One World Trade Center, Michael Arad’s memorial, Snohetta’s museum, Santiago Calatrava’s PATH station, and three commercial towers along Greenwich Street—might be completed or occupied and at what cost. The timing and cost of completing the massive 16-acre project overseen by near-countless agencies had been ballooning since day one, but the collapse of the economy, and particularly the credit markets, added new uncertainty. Struggling for financing on Norman Foster’s Tower 2 and Richard Roger’s Tower 3, developer Larry Silverstein sought assistance from the Port Authority, which balked for a number of reasons. Mayor Michael Bloomberg called a summit in May, attended by Governor David Paterson and Assembly Speaker Sheldon Silver, one of the state’s most powerful politicians who also represents Lower Manhattan. No agreement could be reached at this or a second summit in June, though Silver and Bloomberg threw their weight behind Silverstein, who threatened to sue. Paterson later stepped in, though on the side of the authority. Two weeks ago, Silverstein conceded slightly, pursuing arbitration, which is expected to take some months. Today’s hearing may have little impact on what appear to be stalled negotiations, but it did provide some insight into what has been going on behind the scenes. 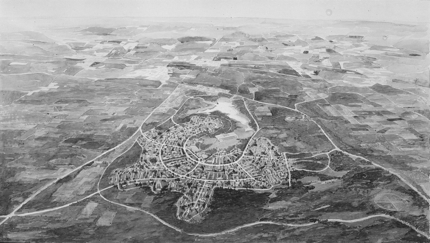 Ward began by outlining progress at the site. 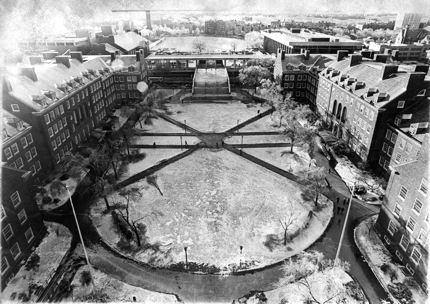 Despite scepticism from Alan Gerson, the local council member holding the hearing, Ward promised that 80 percent of the above ground portion of the memorial would be complete in time for the September 11 tenth anniversary, including the reflecting pools, wall of names, memorial plaza, and many of the trees. The underground portion and the Snohetta museum would still be under construction for another year or two, however, and the entire memorial site would have to be closed at time to make way for site construction. Asked by Gerson if it would be "more open or more closed," Ward insisted on the former. Furthermore, Ward argued he had already expended a great deal of resources at the site, upwards of $11 billion committed to the construction of Tower One and Tower Four—designed by Fumihiko Maki and already under construction—the PATH station, the memorial, and acres upon acres of site infrastructure. To spend much more, at least without a commensurate commitment from Silverstein, would be to jeopardize the remainder of the authority’s capital budget. Lieber echoed Gerson’s argument that the World Trade Center is special and therefore must be completed in a timely manner. “It’s bad for the community,” Lieber said. He also emphasized that his company had contributed billions of dollars in rent to the Port Authority, a significant stake that the developer felt was not being considered when the authority refused to provide financing for the final two towers. “We would lose our equity, we’d be wiped out, and the Port Authority would own the buildings,” Lieber said. He also said that Silverstein had agreed during the prior negotiations to raising hundreds of millions of dollars so long as its lenders would be paid back first, a deal, according to Lieber, the Port Authority declined. (Ward had already left and could not be reached for comment. The agency’s press office did not return requests for comment.) Lieber said it would likely fall to the arbitration to settle the dispute, and while no arbitrator could force one party to build or invest in a project, it could award monetary damages, which could then help Silverstein finance the remaining towers. Part of that argument is that the Port Authority has been dragging out its delivery of the sites for those towers, leading to $300,000 daily payments to the developer, an offset on his rent for not having the parcels ready more than a year ago. Ward announced today that the Port Authority would soon be making the transfer, possibly within days, thereby weakening Silverstein’s complaint both in public and at the negotiating table. “At that point, he’s free to build at anytime, as per our 2006 agreement,” Ward said. 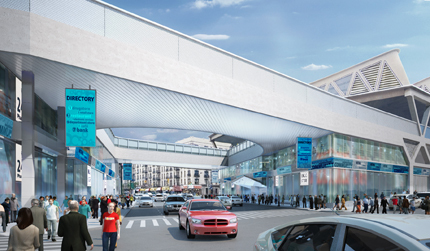 A new Manhattan station for New Jersey Transit at Penn Station is part of the ARC project. Today the New York City Council voted unanimously to approve the land-use plan of the ARC Mass Transit Tunnel, which will add a new rail link between New Jersey and Midtown Manhattan. The council’s consent clears the way for tunnel construction to begin in Manhattan later this year. In June, work began on the New Jersey side near Tonnelle Avenue in North Bergen. The Port Authority and NJ Transit are hoping to complete the massive passenger rail project by 2017, and expect it to create approximately 6,000 construction jobs annually. ARC will double trans-Hudson commuter capacity, increasing the maximum number of trains per hour from 23 to 48. It will also add redundancy to the existing 100-year-old, two-track tunnel. Transit authorities expect the increased rail service to eliminate 22,000 automobile trips per day. The council vote is the final major government approval for the project, which has been on the boards since 1995. From this point on, the only approvals that will remain in ARC’s way will be periodic environmental reviews, said a Port Authority spokesperson. In January, federal authorities completed their approvals, including a sweeping environmental assessment, and approved ARC for $130 million in stimulus bill funds. The $8.7 billion project also received $400 million from the Federal Transit Administration and $125 million in funding from the Federal Highway Administration’s Congestion Mitigation and Air Quality Improvement Program. 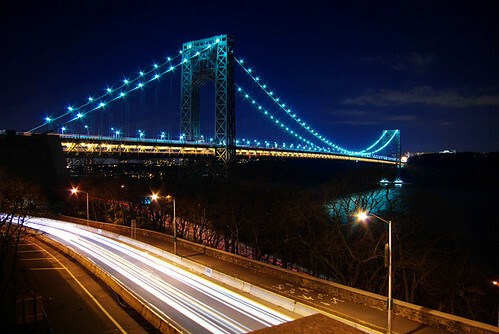 The Port Authority, NJ Transit, and the state of New Jersey apportioned $5.75 billion to the project. 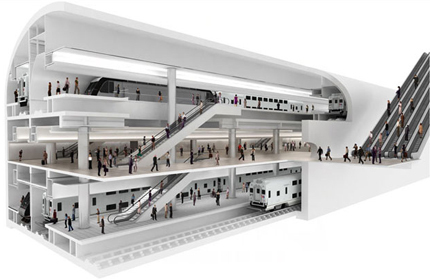 The work in Manhattan will include expanding Penn Station under 34th Street and building underground connections for the first time to the Sixth Avenue subway lines. The Path Train has finally entered the 21st Century. Yesterday, the Port Authority of New York and New Jersey announced a number of new additions that have rocketed the rail line out of its luddite solar system and into a whole new constellation of technology. The Path now boasts new, up-to-date rail cars, an upgraded website (be sure to watch the video), and... drum roll... a Twitter page! Next time you have to ride out to Jersey you can forget the hair gel and gold chains and instead grab your favorite PDA and put on those glow-in-the-dark Ray Bans. The future is now. On November 7 at a symposium held at St. Peter’s College in Jersey City, Port Authority chair Anthony Coscia called on the federal government to fast track the Access to the Region’s Core (ARC) rail tunnel project. Coscia asked the feds to expedite approvals for the project, which would include a new rail tunnel linking New Jersey with Midtown Manhattan, and to include it in the economic stimulus package currently before congress. Critics of the stimulus plan claim that infrastructure projects do not result in a quick increase in jobs because they take so long to plan and execute. But many public works projects have been in the works long enough that they are ready to go. According to a report in The New York Times, 3,000 highway projects totaling $18 billion could get rolling within 30 to 90 days, while $8 billion in mass transit projects could launch within 90 days. The ARC Tunnel project itself was launched in 1995, when it was picked out of 137 alternatives identified by the ARC Major Investment Study. 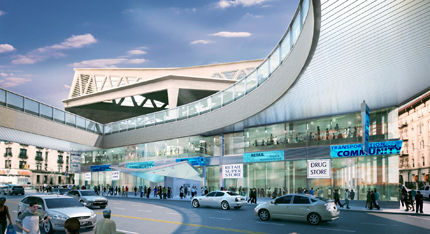 ARC includes the construction of two new tracks in the Meadowlands, two new single-track tunnels under the Hudson River, and an expansion of Penn Station. 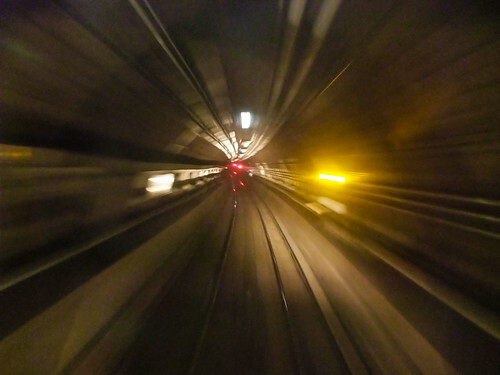 The project will increase trans-Hudson commuter capacity, which is currently near its limit, and improve security by creating a redundant system to accompany the existing trans-Hudson tunnel, which the Pennsylvania Railroad completed in 1909. ARC is advancing through the environmental review and early engineering phase. The Port Authority, NJ Transit, and the state of New Jersey have already earmarked $5.75 billion for the project, roughly two-thirds the estimated cost. With federal assistance, Coscia said, the ARC Tunnel could begin construction as early as 2009.